BACKGROUND AND PURPOSE: The relationship between the local blood oxygen level–dependent (BOLD) signals caused by neural stimulation (fBOLD) and the global BOLD signals induced by hypercapnia (hBOLD) has not been fully investigated. In this study, we examine whether fBOLD is modulated by hBOLD signals, by means of experiments using a relatively wide range of inhaled carbon dioxide (CO2) for a long duration of 5 minutes. 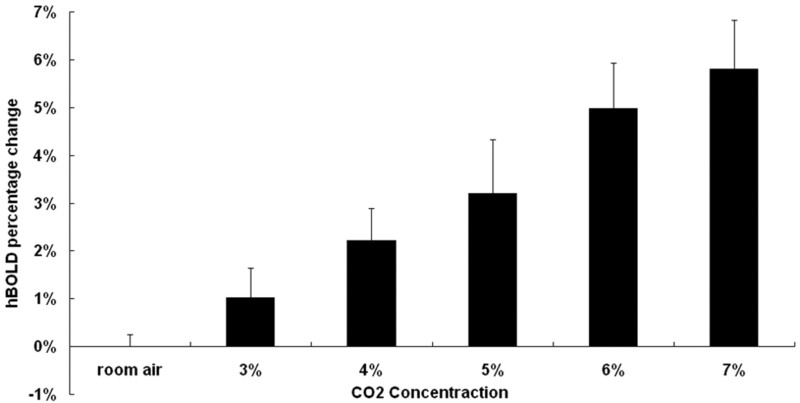 MATERIALS AND METHODS: Ten healthy volunteers were recruited, each undergoing 6 separate experiments by inhaling gas mixtures with different fractions of CO2 (room air, 3%–7%). Each experiment contained 3 phases, prehypercapnic, hypercapnic, and posthypercapnic, during which boxcar visual stimulus was given. The local fBOLD signals were measured from areas showing activation patterns highly correlated with the visual stimulus paradigm, whereas the global hBOLD signals were measured from areas showing no visual activations. 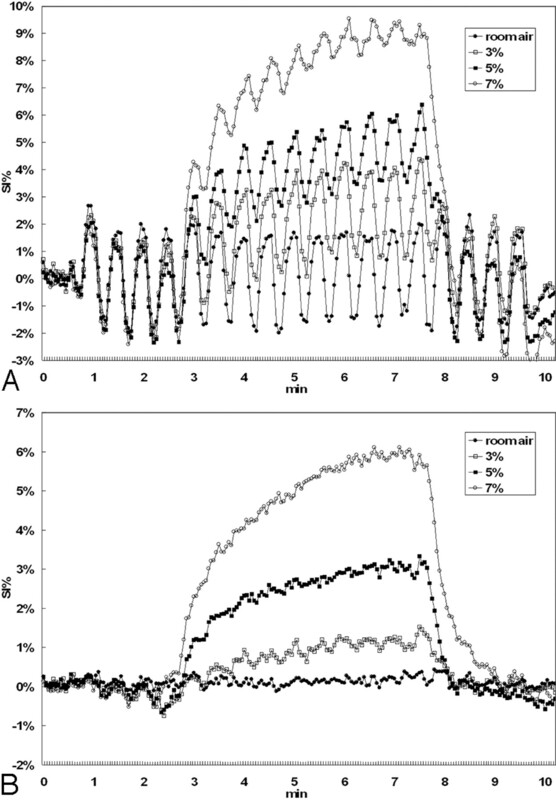 Percentage changes in fBOLD during transient-state hypercapnia and steady-state hypercapnia were both investigated in response to varying degrees of hypercapnic perturbations. RESULTS: The hBOLD signals increased with increase of inhaled CO2 fractions. The duration for the hBOLD signals to reach steady state prolonged with increase of inhaled CO2 fractions. Normalized fBOLD ratio was inversely related to the inhaled CO2 during steady-state hypercapnia but showed positive association with hBOLD during transient-state hypercapnia. CONCLUSION: Our study concludes that the steady-state fBOLD signal intensity is dependent on and inversely related to the hBOLD signals. Previous reports documenting independent and additive relationships between hBOLD and fBOLD may likely be due to transient-state observations. Although functional MR imaging (fMRI) based on the blood oxygen level–dependent (BOLD) contrast has been used extensively in the investigation of human brain function, the results of BOLD fMRI are known to be complicated by many physiologic and nonphysiologic factors. Carbon dioxide (CO2), one of the natural products of cerebral cellular metabolism, is a potent vasodilator that could increase the cerebral blood flow noticeably.1–3 The change of cerebral blood flow may further alter the BOLD signals during fMRI experiments or examinations, causing possible misinterpretation of the fMRI results. Therefore, an understanding of the relationship between the global BOLD signal intensity change induced by hypercapnia (defined as “hBOLD” in this article) and the local BOLD signal intensity change caused by functional neural stimulation (defined as “fBOLD” hereafter) is crucial in interpreting the results of BOLD fMRI experiments. The literature shows several works that focus on the effects of hypercapnia on BOLD signals by direct experimental examinations in humans.4–8 However, there is no conclusive evidence to suggest whether the fBOLD signal intensity change is modulated by hBOLD. Some investigators have reported that the hBOLD and the fBOLD signal intensity changes are independent and additive.4–6 Other research groups argue that the fBOLD signal intensity change is strongly associated with the level of hBOLD.7–9 The discrepancy among these studies has been ascribed to differences in the inhaled CO2 fractions10 or the usage of a normalization method.11 However, none of them have produced conclusive studies that comprehensively explain this discrepancy. We hypothesized that because the cerebrovascular reserve may be limited by original global vasodilation at high fractions of the inspired CO2, hence restricting further neuroactivity-related vasodilation, the fBOLD signal intensity change should be dependent on the level of hBOLD signal intensity change. In other words, previous studies documenting the independence of fBOLD from hBOLD could be an outcome of relatively low CO2 concentration inhaled by the subjects.1–5 Therefore, in our study, we intentionally broadened the range of CO2 concentration up to 7%, as opposed to 5% or lower used in previous studies, to investigate the visual fBOLD signal intensity change in response to hBOLD signal-intensity change at graded levels of CO2 inspiration. In addition, we lengthened the CO2 inhalation period such that the vasodilation status in the transient state and the steady state could both be explored. By these means, we aimed to approach a more detailed examination of the relationship between the fBOLD and hBOLD signals. This study was approved by the institutional review board at our hospital. We enrolled 10 healthy subjects, including 8 men and 2 women with an average age of 27 years. All subjects were normotensive; free from cardiovascular, respiratory, or central nervous system disease; and without alcohol, tobacco, or drug abuse. The documents of informed consent were signed by all volunteers. The gas mixtures were prepared with 0.03% (room air), 3%, 4%, 5%, 6%, and 7% of CO2, and 21% of O2 and balanced nitrogen, respectively. The gas mixture was supplied through a T-shaped 1-way tube. The T-shaped tube has a small reservoir with two 1-way valves, one at either end of the tube, such that the dead space is restricted to approximately 2 mL. One end of the tube is connected to the gas-supplying system, whereas the other end is for releasing the expiratory gas. The T-end of the tube was connected to the mouth of the subject by a mouthpiece holder, with the nose clipped to avoid inhalation mixtures with room air. Physiologic parameters including the pulse rate, respiratory rate, and arterial O2 saturation were monitored (MRI non-invasive vital signs monitoring system, Omni-Trak; In Vivo Research, Weberberg, Germany). End-tidal concentrations of CO2 were sampled (Normocap oxy 200, Instrumentarium, Finland) and digitized via an analog-digital converter (DAQCard-6024E, National Instrumentation, Austin, Tex) as an indirect measurement of arterial CO2 concentration, physiologically the most important factor that affects autoregulation under hypercapnic conditions. All MR images were obtained at 3T magnetic field strength by using a clinical whole-body scanner (Achieva, Philips Medical Systems, Best, the Netherlands). Three-plane orthogonal gradient-echo images were acquired for anatomic localization. The BOLD signal intensity was measured with a gradient-echo echo-planar imaging (EPI) sequence (TE, 35 ms; flip angle, 90°). Twenty-five axial imaging sections were acquired to cover the whole brain. The section thickness was 4 mm; FOV, 240 mm; matrix size, 80 × 80; and voxel size, 3 × 3 × 4 mm. To match the visual stimulation protocol, we repeated the EPI scan at 3-second intervals with a total of 205 frames for each section location. The total scanning period lasted for 10.5 minutes in each experiment. The experimental paradigm is graphically illustrated in Fig 1. Each experiment consisted of 205 scans with a sampling interval of 3 seconds. Information on visual stimulation was transmitted to the subjects by an MR-compatible goggle (Commander XG, MRI audio system; Resonance Technology, Northridge, Calif). Visual stimulation via a checkerboard pattern flashing at the frequency of 8 Hz was given with the block design of 5 scans (15 seconds) “OFF” and 5 scans (15 seconds) “ON” following the first 10 dummy scans. The subject was instructed to focus on the red cross at the center of the screen throughout each single experiment. Each experiment included 3 phases, prehypercapnic, hypercapnic, and posthypercapnic, each lasting 2.5 minutes, 5 minutes, and 2 minutes 45 seconds, respectively. The CO2 gas mixture was given at the hypercapnic phase. Room air was supplied at the prehypercapnic and posthypercapnic phases. Illustration of the experiment paradigm that simultaneously measures hBOLD and fBOLD. Each experiment consists of 3 phases: prehypercapnic phase (room air), hypercapnic phase (CO2 gas mixtures), and posthypercapnic phase (room air). Boxcar visual stimulation is given 30 seconds after the starting of image acquisition and then throughout the entire experiment session. The example of a 4 OFF–4 ON (5 scans each) design is illustrated within the 2-minute prehypercapnic stage. All MR imaging data analysis was performed by using the statistical parametric mapping software (SPM5, Wellcome Department of Cognitive Neurology, London, UK) on the Matlab (MathWorks, Natick, Mass) platform. First, all images were corrected for head motion and then smoothed with a Gaussian kernel (full width at half maximum equal to 6 mm). Statistical parametric maps were calculated for the condition-specific effects with a general linear model. Areas of activation were selected by a pixelwise examination of the signal intensity time courses in association with a boxcar reference function, based on the data acquired during the first 4 visual stimulation cycles in the prehypercapnia phase. We identified the activated areas as the pixels within the visual cortex fulfilling the statistical threshold of P value < .01 (uncorrected for multiple comparisons), taking into account the pixel clustering and the possible time lag from hemodynamic response function. Approximately 100–400 pixels met the aforementioned criteria in each of our subjects. The averaged signal intensity of these pixels of activation was used for fBOLD percentage analysis. The percentage changes in fBOLD signals were calculated via 1 or 2 OFF-ON visual stimulation cycles for all 3 gas phases, as illustrated in Fig 2A. For the prehypercapnic and posthypercapnic phases, the 2 OFF-ON cycles near the end of these phases were selected for data analysis. For the hypercapnic phase, the first OFF-ON cycle at the beginning and 2 OFF-ON cycles at the end of this phase were both selected to represent the CO2-induced vasodilation in the transient state and in the steady state, respectively. To avoid the influence of variations in BOLD signals in different experiments, we normalized all percentage changes in fBOLD with respect to the corresponding prehypercapnia fBOLD values (fBOLD ratio). Signal intensity variations during a single experiment for the illustration of data analysis, with the subject breathing a gas mixture containing 5% CO2. A, Signal intensity of the activated visual cortex consists of both fBOLD and hBOLD components. For the prehypercapnic and posthypercapnic phases, the signals corresponding to the 2 visual stimulation blocks (2 OFF and 2 ON, as indicated in the figure) are used for fBOLD signal intensity analysis. For the hypercapnic phase, the signals of the first OFF-ON cycle and 2 OFF-ON cycles at the end are used to reflect the transient-state response and the steady-state response, respectively. The fBOLD signal intensity change in each phase is calculated by the difference between the average of 2 ON-state signals and the average of 2 OFF-state signals. Only 1 OFF-ON cycle is chosen for transient-state hypercapnia analysis to minimize the influence from hBOLD-induced baseline changes. B, Signal intensity of the brain area near the visual cortex but without showing fBOLD activations consists of the hBOLD component only. The hBOLD signal intensity change is computed as the difference between the average of the last 25 scans in the hypercapnic phase and the average of the last 50 scans. To evaluate solely the global hBOLD signal intensity changes perturbed by the inhaled CO2 during the same period of visual-stimulation experiments, we defined the fBOLD-nonactivated areas as pixels outside the primary visual cortex area and satisfying the statistical threshold with a P value between .1 and .9. The setting of the P value threshold ensured that higher visual areas that could show minor response to the flashing checkerboard stimulus were not included in the hBOLD analysis. Approximately 800–3000 pixels met the aforementioned criteria in each of our volunteers. The averaged signal intensity of these pixels was used for hBOLD analysis. The percentage changes in hBOLD were calculated as the signal intensity difference between late hypercapnic and posthypercapnic phases, divided by the signal intensity of the posthypercapnic phase (Fig 2B). The analysis of variance (ANOVA) was used to examine the differences among the 6 inhaled CO2 concentrations regarding the hBOLD and fBOLD responses. Pairwise comparisons of hBOLD and fBOLD signal intensity changes between different gas conditions were made by using a paired t test (2 tails). The results were considered statistically significant when the P value was less than .05. The pulse rate and arterial oxygen saturation remained constant throughout the entire experiment duration for all the subjects, suggestive of good and stable compliance with the CO2 inhalation procedure. The steady-state end-tidal CO2 concentrations after inhalation of the 6 gas mixtures were (mean ± SD) 38.03 ± 0.58 mm Hg (room air), 39.48 ± 0.37 mm Hg (3% CO2), 40.80 ± 1.37 mm Hg (4% CO2), 46.10 ± 1.21 mm Hg (5% CO2), 49.42 ± 0.73 mm Hg (6% CO2), and 54.15 ± 1.66 mm Hg (7% CO2), respectively. The end-tidal CO2 data showed strongly positive association with the inhaled CO2 concentrations, suggesting arterial CO2 levels in qualitative accordance with the gas mixtures for our subjects. The mean signal intensity–time curves of all subjects in the activated visual cortex and in the nonactivated pixels were presented for 4 CO2 concentrations as shown in Fig 3A, -B, respectively. All curves in Fig 3A were seen to exhibit baseline shapes similar to those shown in Fig 3B, plus an overlap of OFF-ON fBOLD signal intensity modulations in accordance with the visual stimulus paradigm. Note, however, that the fBOLD signal intensity changes seemed to continuously decrease in amplitude during hypercapnia and returned to prehypercapnia fBOLD levels during posthypercapnia (Fig 3A). In addition, the decreases in the fBOLD signals during hypercapnia became more prominent as the inhaled CO2 concentration increased. On the other hand, the percentage change in hBOLD signal intensity, as expected, was positively related to the inhaled CO2 concentration (Fig 3B). The mean percentage changes of BOLD signals as a function of time for the 6 subjects included in this study. Only 4 curves (room air, 3%, 5%, 7%) are shown for better visualization clarity. A, The signal intensity (SI) response shows the ON-OFF fBOLD pattern in response to the visual stimulation, superimposed on hBOLD changes from hypercapnia. Note the gradual decrease of fBOLD amplitude from early to late hypercapnia that is particularly prominent at high concentrations of CO2 inhalation. Furthermore, steady-state fBOLD signals are seen to decrease with increasing CO2 concentration. Posthypercapnic fBOLD amplitude returns to a level similar to the prehypercapnic phase. Min indicates minutes. B, The hBOLD signal intensity changes positively correlate with the inhaled CO2 concentrations. In addition, the time duration to reach steady-state hBOLD level seems to increase with higher hypercapnic perturbations. For more detailed quantitative examinations of the previously mentioned phenomena, Fig 4 shows the percentage changes of hBOLD (mean ± SD) under all 6 different concentrations of CO2. The hBOLD signals during late hypercapnia were seen to increase from 1.02% (with 3% CO2) to approximately 5.8% (with 7% CO2), indicating a positive association. Paired t test analysis showed a statistically significant difference in the hBOLD signal intensity changes among all gas conditions. Steady-state hBOLD signal intensity changes plotted versus CO2 concentration. There is a tendency for the hBOLD signal intensity change to be positively correlated with the concentration of inhaled CO2. Figure 5 shows the percentage changes of fBOLD (mean ± SD) with respect to different concentrations of CO2 during prehypercapnia, transient-state hypercapnia, steady-state hypercapnia, and posthypercapnia. Note that the fBOLD signals remained largely invariant at a level of approximately 3%–4% for prehypercapnia and posthypercapnia stages. In fact, if we used prehypercapnia fBOLD as a reference to normalize fBOLD at subsequent stages, it would be seen that the fBOLD ratio was approximately 1.1 in all gas conditions for posthypercapnia without a statistically significant difference among them (ANOVA, P value=.77). However, the trends of fBOLD signal intensity changes for hypercapnia stages, in terms of alterations with respect to CO2 concentrations, were opposite during transient-state and steady-state conditions. The transient-state fBOLD increased gradually to the level of approximately 6.8% at 7% CO2, whereas the steady-state fBOLD dropped substantially as CO2 concentration increased, reaching 1.3% level at 7% CO2. In transient-state hypercapnia, the increases in fBOLD ratio became noticeable at CO2 concentrations greater than 4% (paired t test, P < .05), showing fBOLD ratios of 1.05 ± 0.16, 1.15 ± 0.13, 1.17 ± 0.10, 1.51 ± 0.25, 1.67 ± 0.34, and 1.84 ± 0.37 under room air, 3%, 4%, 5%, 6%, and 7% CO2, respectively. In steady-state hypercapnia, on the contrary, the fBOLD ratio decreased monotonically in all gas conditions containing CO2 concentrations higher than the room air condition (fBOLD ratios for room air, 3%, 4%, 5%, 6%, and 7% CO2 equal to 0.94 ± 0.09, 0.87 ± 0.16, 0.78 ± 1.96, 0.65 ± 0.26, 0.51 ± 0.18, and 0.40 ± 0.15, respectively). Results from paired t test analysis showed statistically significant difference in the steady-state fBOLD signal intensity changes among all gas conditions with inhaled CO2 concentrations > 4% (P < .05). Percentage fBOLD signal intensity changes under different CO2 concentrations. The prehypercapnic and posthypercapnic fBOLD remains similar at the level of 3%–4%. During hypercapnia, changes in the fBOLD signals tend to increase in the transient state but step down in the steady state as the CO2 concentration becomes higher. TS indicates transient state; SS, steady state. Hypercapnia, whether caused by inhalation of CO2-containing gas mixtures4,5,7,12–14 or by breath-holding,6,15 results in dilation of the cerebral blood vessels and increase of cerebral blood flow (CBF).16,17 The consequent increase in the global BOLD signals (termed “hBOLD” in this study) therefore positively correlates with the increase of CBF under hypercapnic perturbation.5 Quantitatively, animal studies have shown that an inhalation of 5%–10% CO2 gas mixture results in approximately 50%–220% increase of CBF and 4%–10% increase of BOLD signals, respectively.11 In human experiments, on the other hand, a 40%–59% increase of CBF and a 3% increase of BOLD signals have been documented under 5% CO2 inhalation.16,18,19 In our study, in which the concentrations of the inhaled CO2 were intentionally extended from room air to 7% of CO2, the hBOLD results agreed well with literature reports. In addition, our results further showed a gradual increase of the hBOLD signal intensity changes in proportion to the increase of inhaled CO2 fractions (Figs 3B and 4), consistent with the opinion of Rostrup et al10 with respect to the concept of vasodilation in hypercapnia. With a detailed review of the articles reporting conflicting findings,4–8 however, we found that the concentrations of inspired CO2 were all similar and restricted to 5% of CO2 or lower (Corfield et al, 4%4; Hoge et al, 1.25% to 5%5; Li et al, breath-hold, equivalent to approximately 5% CO2 inhalation6; Bandettini and Wong, 5%7; and Cohen et al, 5%8). This suggests that the discrepancy among literature reports, even resolvable by our steady-state hypercapnia data, was not completely due to difference in inspired CO2 fractions. In our opinion, one major difference between research groups holding the 2 different hypotheses is the experiment design. In the studies hypothesizing an independent and additive relationship between fBOLD and hBOLD, including those of Corfield et al,4 Hoge et al,5 and Li et al,6 the visual stimulation and the hypercapnic perturbation were performed simultaneously. Therefore, the visual stimulation blocks in these studies4–6 were likely situated in the early transient state, rather than in the steady-state hypercapnic condition. In contrast, in the studies supporting the hypothesis of a mutually dependent relationship between fBOLD and hBOLD, including those of Bandettini and Wong7 and Cohen et al,8 the hypercapnic perturbations were given for a longer duration (3 minutes) and contained multiple visual stimulation blocks (4 blocks in the study of Bandettini and Wong7 and 6 blocks in that of Cohen et al8). Our study, by using an even longer period for 5 minutes of hypercapnic challenging condition with 10 ON-OFF visual stimulus blocks, showed that it took roughly 150 seconds to reach the steady state of fBOLD and hBOLD response after starting inhalation of 5% CO2 (Fig 3A). Note that this time length needed to approach steady-state hypercapnia was found to be similar to the values in the articles by Bandettini and Wong (120 seconds)7 and Cohen et al (150 seconds).8 Consequently, when the steady-state hypercapnia was reached, our results that fBOLD decreases with increase in hBOLD supported their hypothesis that fBOLD is dependent on and damped by hBOLD. The time delay from the transient state to the steady state of hypercapnia can be explained by the large pulmonary reserve (3–5 L), in which the inhaled CO2 mixes with the residual air in the lungs. During the prehypercapnia stage with room air inspiration, the average CO2 concentration in the lungs is expected to be low. After starting of the hypercapnia challenge, the CO2 concentration in the lungs gradually increases until the mixture of inspired and expired air reaches an equilibrium state. In other words, the fBOLD signal intensity changes in the early transient state under 5% fraction of inhaled CO2 probably correspond to the fBOLD signal intensity changes in the steady state under, for example, 2%–3% fraction of inhaled CO2. Intuitively, this transient-state bias would likely be more pronounced under a higher fraction of inhaled CO2, in which the duration to reach the steady state gets longer, approximately 1 minute under 3% CO2 to 4 minutes under 7% CO2, as shown in the data from our subjects (Fig 3A). From the inferences previously mentioned, it is not surprising that the relationships between fBOLD and hBOLD showed different trends during transient-state hypercapnia and steady-state hypercapnia in our study. Whereas the transient-state hypercapnic fBOLD ratio showed a slightly positive correlation with inhaled CO2 concentrations (Fig 5), the steady-state fBOLD ratio showed an obviously negative association (Fig 5). 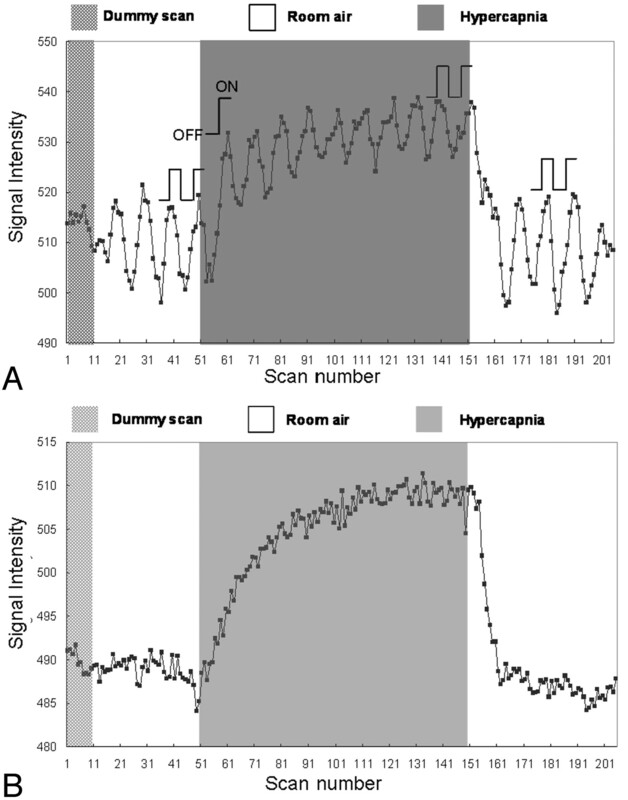 The fBOLD behavior in steady-state hypercapnia clearly supports our hypothesis that the cerebrovascular reserve may be limited by global vasodilation at high inspired CO2 fractions, restricting further vasodilation due to visual stimulation. As to the transient-state behavior, we prefer not to overinterpret the current results because of the changing baseline during transient-state hBOLD response. One may argue that the gradual decrease in fBOLD signals (Fig 4A) could possibly originate from physiologic fatigue after repeated stimulation of the visual cortex for a very long duration, which might contaminate the fBOLD signals in response to CO2 perturbations. To rule out this possible drawback of experiment design, we set the hypercapnic phase between 2 baseline (room air) phases. By comparing the posthypercapnic fBOLD signal intensity changes with the prehypercapnic phases, we could assess the stability of visual response. Our result showed a consistently stable visual response between the posthypercapnic and prehypercapnic phases, with posthypercapnia-to-prehypercapnia ratio of fBOLD response approximately equal to 1.1 in all CO2 fractions (Fig 5). This suggests that the problem of visual fatigue was unlikely a factor affecting our results on hypercapnic fBOLD in the presence of CO2 perturbation. Sicard and Duong11 pointed out the important difference in the hypercapnic experiments between absolute fMRI signal intensity changes (ie, percentage signal intensity changes relative to the fixed baseline image signals) and relative fMRI signal intensity changes (ie, signal intensity changes normalized relative to one's own respective room-air fBOLD signals). They used the relative fBOLD signal intensity changes to eliminate the influence of interexperiment baseline variations. We agreed with the comments of Sicard and Duong about the concept of normalization for comparison. Therefore in our study, we also normalized the fBOLD percentage changes by the prehypercapnia fBOLD under room air condition in each single experiment (ie, the fBOLD ratio). According to the results from our study (Fig 5), the percentage fBOLD amplitudes under room air conditions were indeed variable in different experiments, ranging from approximately 3% to 4%. Inter-experiment bias was hence likely to be unavoidable in previous studies on hypercapnia fMRI by using a single fixed baseline value as the normalization factor.4–8 It is thus clear that the advantage of normalization is to eliminate interexperiment and intersubject variations such that an accurate comparison could be made objectively. By investigating the fMRI response with a wide range of CO2 concentrations up to 7% and a long duration of 5 minutes, our study provides a more comprehensive spectrum of fBOLD response under different hypercapnic situations. Although BOLD fMRI studies performed on healthy subjects are unlikely to encounter physiologically modulated partial pressure (tension) of CO2 (pCO2) changes as large as those used in our study, results from our study are still valuable in the potential applications of BOLD fMRI to daily clinical practice such as presurgical localization of the motor cortex in the presence of brain tumor.20 In addition to a manual supply of high-concentration CO2,6,10 pCO2 increases in situations such as breath-holding,6,15 airway obstruction as in asthma,21 chronic obstructive pulmonary diseases,22 ventilation-perfusion mismatch (acute pulmonary embolism) and acute respiratory failure,23 or drug overdose.24 Under such situations, false-negative results of BOLD fMRI caused by an unknown level of increased pCO2 could lead to inaccurate surgical decision-making. Our results, therefore, have important implications in suggesting a careful interpretation of BOLD fMRI data by taking into account the effects of, for example, end-tidal CO2 concentration. The precise level of pCO2 and its effects on the BOLD fMRI results in the aforementioned diseases certainly await further investigations. There are some limitations in our study. The first limitation is that it is ultimately the arterial pCO2, not inhaled CO2 concentration, that determines hypercapnia-related fBOLD signal intensity changes. Placement of an arterial line is the gold standard to measure arterial pCO2, which is, however, impractical for volunteer study due to its invasive nature. An alteration in the respiration rate could have led to variations in arterial pCO2, even with inhalation of the same gas mixtures. To remedy the above pitfalls, we have recorded the end-tidal CO2, which has been shown to be a reliable indirect measure of arterial pCO2.17,25 The end-tidal pCO2 values were shown to be strongly associated with the inhaled CO2 concentrations, which at least qualitatively support the validity of our study design. A second limitation is that the analysis of fBOLD during transient-state hypercapnia is subject to inaccuracy due to the continuously changing baseline. In fact, the hBOLD signals may not have reached steady-state even with 5-minute inspiration of 7% CO2 (Fig 3A). Even if the fBOLD signal-intensity change at 5-minute challenge of 7% CO2 has already provided us strong evidence that fBOLD and hBOLD are mutually dependent, it is advised that our data on transient-state fBOLD signals should be regarded as preliminary findings. Further investigations clarifying the behavior of the transition into steady-state hypercapnia are necessary before the transient-state fBOLD effects could be fully explored. In conclusion, our study showed that fBOLD signal intensity changes are dependent on and inversely related to hBOLD signals under steady-state hypercapnic perturbations. 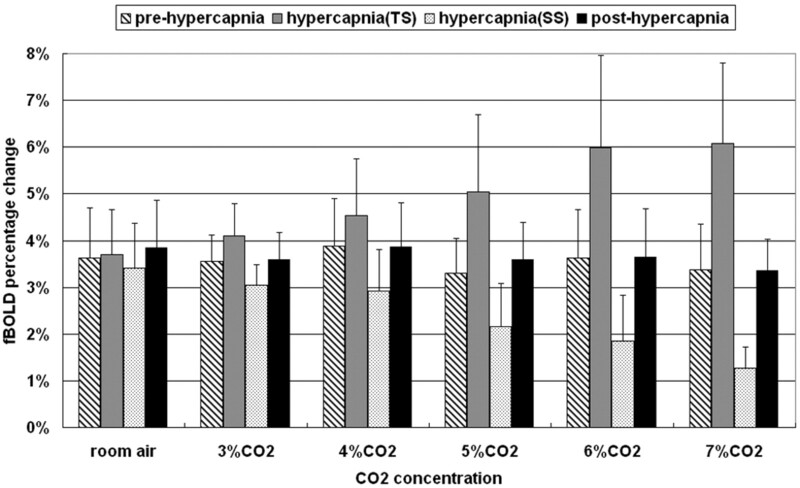 The duration to reach steady-state hypercapnia lengthens with increased fraction of inhaled CO2. Previous articles reporting mutually independent and additive relationships between fBOLD and hBOLD may likely be an outcome due to transient-state conditions. We thank Hsiao-Wen Chung for editing the manuscript. This work was sponsored in part by Tri-Service General Hospital with Grant TSGH-C94–29 and by the National Science Council with Grant 94–2213-E-035–043, Taiwan, ROC. Accepted after revision November 13, 2006.